Kichler® LED accent lighting helps showcase landscape features with true, clear, warm, white light without intruding on the scene. With the addition of eight new models for 2008, Kichler® LED Accent Lights are now available in three wattages, 3-W, 6-W and 9-W and three beam spreads, 10°, 35° and 60°. Unequaled in the industry, this range of wattage and beam spreads allows for customized light planning and selection and reduces the need for cowls. 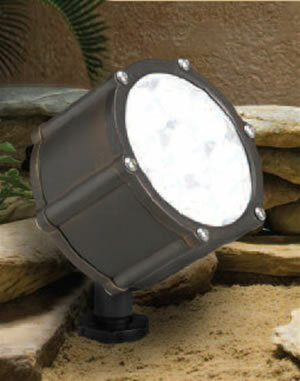 A selection of mounting options and colored lenses makes these low-profile accent lights totally versatile. 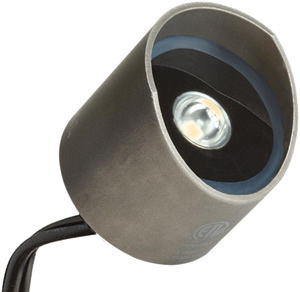 Available in long-lasting die-cast aluminum or solid brass housings, this new LED Series features a threaded mounting stem and locking nut and includes an integral driver for ease of Installation. 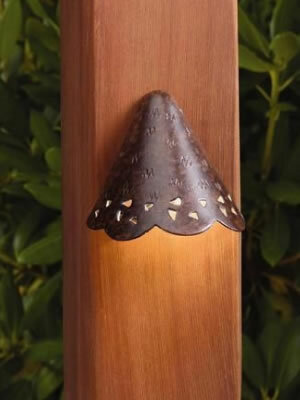 Use these LED accent fixtures for up or down lighting, to accent detail, staked or flange-mounted for deck and rail lighting. Reshaping the way you think about Accent Lighting - LED lighting. 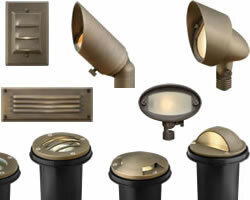 The 8 new LED accent fixtures available in 3 different wattages and 3 varying beam spreads provide choices unequaled in the landscape lighting industry for perfecting the ultimate long lasting professional Installation. 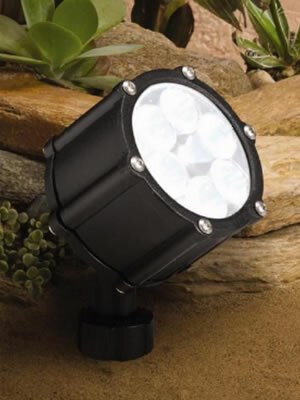 LED accent lighting, deck, patio and step lights allow for complete energy efficient installations without compromising the quality of the light output or color temperature. 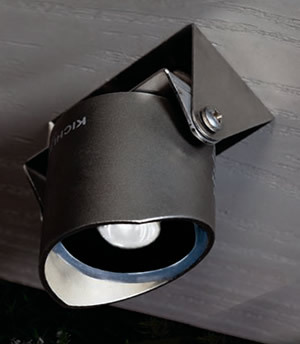 Kichler's light emitting diodes (LED's) use 75% less energy resulting in lower operating costs and a reduction of light pollution in the environment. 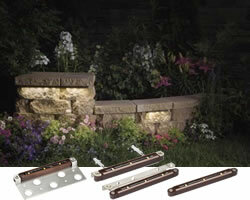 LEDs also virtually eliminate voltage drop issues. Professional grade housing teams with 40, 000 (approximately 20 years) hours of life before replacement is needed. Kichler LED Landscape Lighting also provides dramatically reduced operating costs, ultimate precision in lighting design and reduced costs in transformers required for the Installation. The new LED will make the neighbors green with envy and the planet green with pride, reshaping the way you think about Accent Lighting. The color of light is referred to as its temperature and is measured in Kelvin(K). Most incandescent light ranges between 2600 and 3100 K. At approximately 2800 K, Kichler's LED accent lighting is true, clear, white light. U.S. Patent Pending. 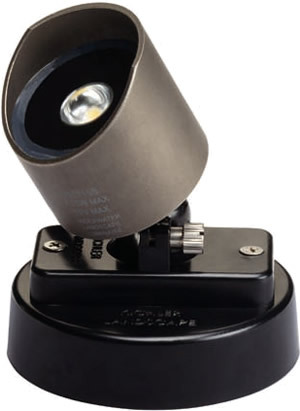 Constructed in either long lasting die cast aluminum or solid brass housings, this latest LED Series features threaded mounting stems and locking nuts to allow for simple Installation. 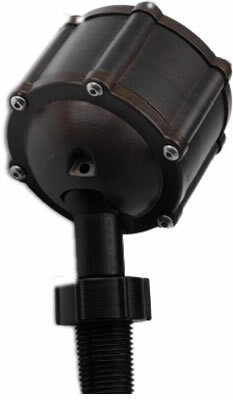 Kichler also added integral drivers to each fixture, so there is less equipment to buy or bury. Housing: Die-cast aluminum or die cast brass with clear tempered glass lens and polycarbonate mounting stem and locknut. 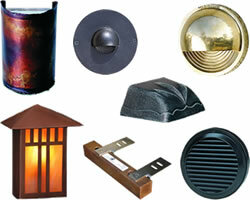 Die cast aluminum with hard coat anodized and durable powdercoat finish. Hexagonal housing — 2" hex by 1- 1/4" deep. Individual accent light fixtures have 25 feet of #18-2 direct burial lead wires. Multi-packs have 25 feet of #18-2 direct burial lead wire and 12 feet of #18-2 direct burial wire between each fixture. Orbital stem for directional control, with brass tightening screw. Wiring: 24' of usable #18-2, SPT-1-W leads. Cable connector supplied with fixture. 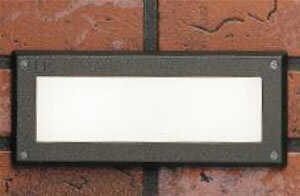 Light Source: Illumination provided by integrated LED chips. Separate driver is NOT required with this Series. Wire to typical low-voltage transformer. Designed to be integrated into a brick wall during construction. LED version is also usable in vertical risers. 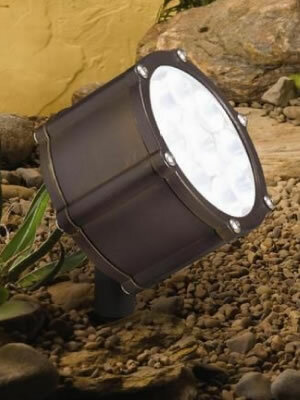 Casts a low, even spread of energy efficient LED light. Height 4" x Length 3.76" x Width 9.5"
Wiring: Wire connection must be made inside junction box. LED Decorative Hammered Roof Accent Light Traditional designed pierced shade and scalloped edge combines with the energy efficient benefit of LED technology. Height 3" x Length 1.86" x Width 3.5"
Wiring: 72" of usable #18-2, SPT-1-W leads. Cable connector supplied with fixture.